Gullible's Travels: Daddy, what did you do in the great war? My Dad has always been reticent about what he did in the last war. I know that some veterans prefer not to talk about their experiences. Enquiring indirectly via Mum it turns out that he didn't seems to think there was much to tell - ferrying American tanks to Omaha Beach following the D-Day landings! My career in the Royal Navy. I was called up in 1943 (18 yrs old) and they gave you the choice of Navy, Army or RAF. I chose the Navy. You start as an Ordinary Seaman with 3 months preliminary training. A number of us were singled out as possible officer material and put into a special class. After this you served for 3 months on the lower deck of a ship which was an invaluable experience. You then went for officer training at Brighton (Lancing College and were passed, or otherwise. I was now, because of my age, a Midshipman to start with and later a Second Lieutenant. I was posted to a Tank Landing Craft with a C.O., myself and a crew of 10 - 12 seamen. 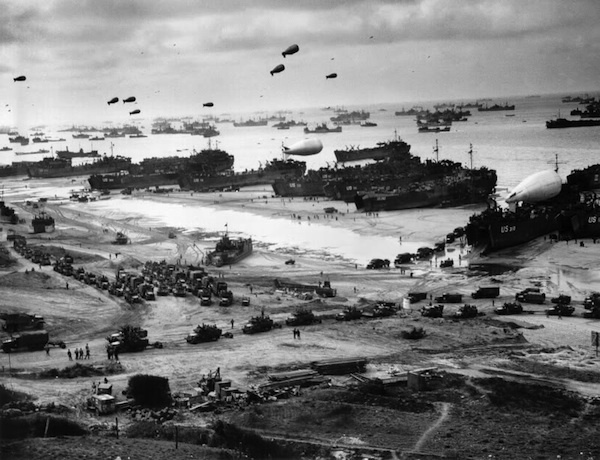 This was about 2 weeks after D-Day in June 1944. Our job was to carry 6 American tanks and crew to Omaha Beach on continuous trips backwards and forwards to reload. * By this time the beaches had been cleared although you could sometimes hear inland gunfire. The war ended in 1945 and I was demobilised in 1946, returning to my architectural studies which had been disrupted. P.S. In my first week back I shared a studio with a certain Margery Scales. The rest is history. * which Dad later clarified was for about 6 months making over 30 round trips.